I purchased my first standard poodle, Caesar, at Thanksgiving in 1982. He was shipped from Florida to me in Washington D.C. sight unseen, and it was the beginning of a lifetime of love and devotion to the breed. Prior to my first standard poodle I had always had dogs and owned various breeds including German Shepherds and Dobermans. Those two are great breeds but they both presented challenges for me and my lifestyle. By this time I already had 4 (of my 6) children and as an Army officer and a helicopter pilot I traveled a great deal. I wanted a dog that was as intelligent and loyal as the previous dogs I had owned but one that did NOT shed. I also wanted a dog that would be protective, but not to the extent that I had to worry when dozens of neighborhood children would run in and out of the yard and house. As the years passed I started showing my poodles in obedience, obtaining a Companion Dog (CD) certification on Caesar very quickly. My husband at that time showed American Staffordshire Terriers in confirmation and obtained AKC Champion titles on two of them. After our divorce it was too time consuming for me to continue to show my poodle and be a working single parent raising 6 children. So I only bred on occasion, keeping what I thought was the best representation of the breed. 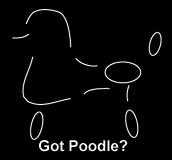 In the summer of 1998 I had the unique opportunity to reacquire some poodles I had whelped and sold; a boy and two girls. Before I made the leap from three to six standards I made the decision to breed and show standard poodles full time when I retired from the military and needed to do two things right at the start to be successful. First was to compete my dogs in confirmation, not just obedience, and second was to find a handler as my career still keeps me too busy to show on my own. CH. Shipps Anani Keanu was my first champion and although I cannot take any credit for his breeding he has a wonderful pedigree and was expertly finished by Paula Ford of Aldea Kennels. CH. Ulysses, my first home bred silver champion, is the result of 5 generations of selective breeding and a little good luck. Ulysses was shown by Stan Voge and took 3rd in the American Bred Class at the 2003 Annual Poodle Club of America competition. It really is not enough for me to say that I have great dogs, a judge representing the collective expertise of the American Kennel Club must think likewise. I sincerely believe I am well down that path.